Australian Open champion Kim Clijsters plans to play on for a maximum two years following her remarkable run of success since returning to the tour in 2009 after taking time out to have a baby. Clijsters, 27, has proved an almost unstoppable force at the majors after a 2-1/2 year maternity break, winning three of her four Grand Slam titles after the birth of her daughter Jada. 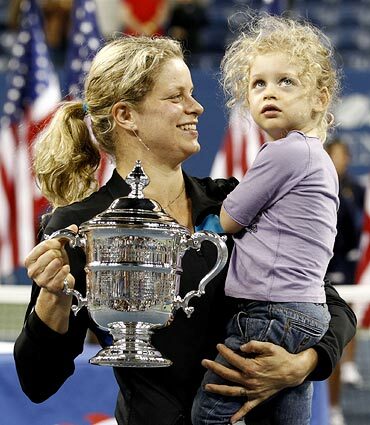 While many now hold her up as a torchbearer for working mothers -- at the 2009 US Open she became the first mum to win a Grand Slam for almost three decades -- Clijsters said she had worked out her retirement date based on family commitments. "It's a lifestyle that we chose and it's not going to be for another 10 years, maximum two years," the bubbly Belgian said as she prepared for Belgium's first-round Fed Cup tie against the United States. "That's why we tried to enjoy a lot of the things as well and Jada is a good kid, she likes to travel and she enjoys just being in different part of the world. She really takes it all in now, she is at a good age, she really learns a lot." While most players stick to a rigid timetable of playing matches, training, practising and getting massages during tournaments, Clijsters has adopted a more unconventional schedule. With Jada in tow, she has fitted in trips to the zoo, strolls through the park and rides on horse-drawn carriages around her matches. It is a formula that has proved successful for a player who was once accused of being an undeserving world number one because she reached the pinnacle of the sport before winning a Grand Slam. While Clijsters now stands on the cusp of regaining that top ranking, the three-times US Open champion insists that family life remains her number one priority. "There are days I find it hard and I almost feel guilty towards my daughter and towards my husband but you know at the end of the day I am lucky because I still see everybody every day," said Clijsters. "Other mothers have to work too and they have to bring their children to family members or to day care or anything like that." She also does not want her daughter, who turns three later this month, to lead an unsettled life for much longer. "I am getting a little bit older now too and Jada is going to start having to go to school as well so there is a lot of things in my personal life that to me are a lot more important than being on the road and playing tennis. "So that's why... I could stop today if they told me to so for me it's not like I have to play tennis every day."